The Shield is a character that few probably recognize, and most will probably see the new series that debuts this Wednesday and see a feeble attempt at a Captain America ripoff. The fact of the matter, however, is that The Shield predates Captain America by fourteen months, debuting in January of 1940 as the first superhero comic book to feature a flag donning patriot. 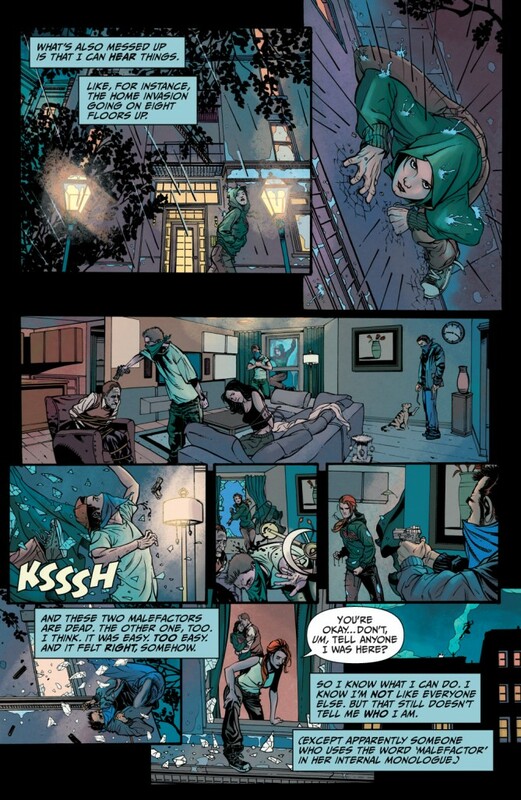 Archie’s horror line has garnered much acclaim, as have the few bits and pieces of its new Dark Circle imprint that have come out in the last several months, but the new Shield series written by novelists Adam Christopher and Chuck Wendig with art by Drew Johnson has perhaps been the most intriguing endeavor of the publisher yet. The series follows Victoria Adams–although you don’t know that just yet. She is the spirit of revolution, a patriot hero with a mysterious past. 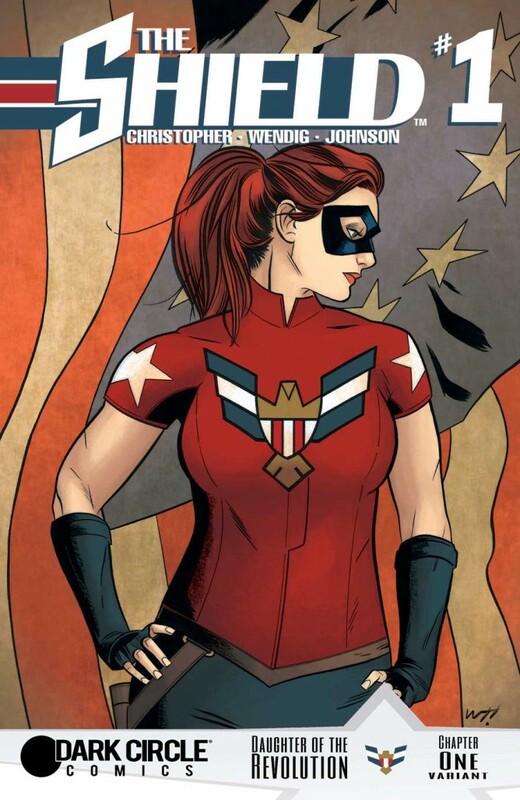 The issue begins with a scene during the American Revolutionary War, but quickly jumps to modern day, where our protagonist is struggling to figure out who she is and who she can trust as a shady government agency tracks her every move. The first thing you’ll notice about the series is that, refreshingly, it is not a typical origin story. Instead of the usual supernatural or super-scientific circumstance giving Victoria powers, we get a careful building of character. We see perhaps her first outing as The Shield fighting the British in the silent opening pages of the book, but soon meet our modern day hero in a sort of cold open. She doesn’t know who she is, but we learn she has been picked up by the police for damaging public property while stopping some petty crime. As she escapes and gradually sees elements of American history everywhere (the book takes place in Washington, D.C.), she begins to remember bits of her history and purpose, but the origin remains mysterious. It’s a nice way to introduce the character that feels fresh and avoids most of the 'blah' moments that often plague first issues. Johnson, who has had art duties on a few other female super heroines, does a really nice job lending a unique tone to the book. 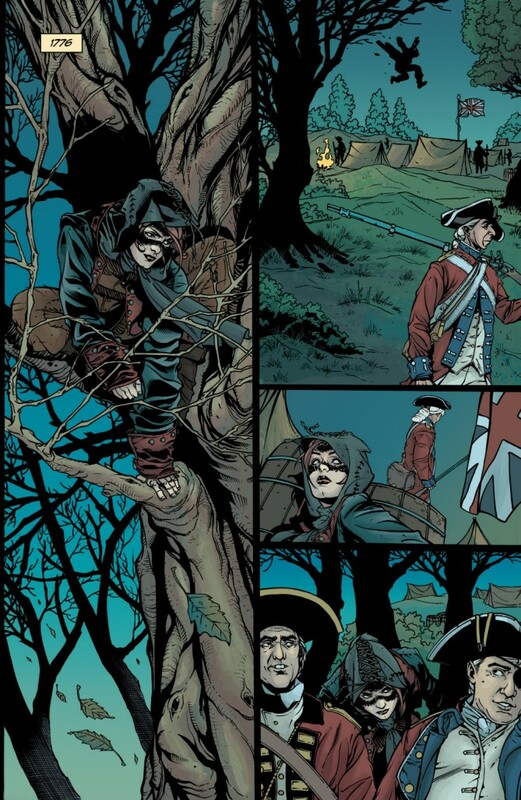 The art is modern and detailed, and feels just as appropriate in the 18th century as it does in the modern story. it has a dark, muted look that fits the intrigue and mystery of the book. Best of all are the panel layouts, which keep things exciting with their overlapping action without being over-the-top or inconsistent. The character design of The Shield–although we have not seen her don the costume outside of the cover–is very nice; she’s tough without being masculinized and feminine without being over-sexualized. Wendig and Christopher provide a tight script that mostly avoids tropes while providing a smart gradual introduction to their lead character. Rather than using heroic grandstanding and dramatic monologging to get across the personality and morals of Victoria, the story shows us in the margins of the main storyline what she cares about and who she is–as she learns as well. The Shield’s powers of strength and regeneration are played down and left unexplained, which leaves more room for the political thriller that is being carefully set up. Although I’m not entirely sold on the potential villain of the series who might have some subtle powers as well and seems a little too devilish with his strange choice of facial hair, The Shield #1 has a lot going for it. From the non-origin introduction to the action-oriented art, this book is definitely one to look out for! The Shield #1 comes hits the shelves of your local comic book shop and on Comixology this Wednesday, 10/21 from Dark Circle Comics.